(1) Stars are hot stuff. Nuclear fusion occurs naturally in stars and happens when like-charged atomic nuclei join together to form a heavier nuclei. (2) He’s not heavy, he’s my lower mass nuclei. Nuclear fusion can release or absorb energy relative to whether the nuclei have a mass lower than iron. If the nuclei have a mass lower than iron, the process releases energy, but if heavier than iron the process will absorb energy. (3) The cycle of nuclear fusion in stars was worked out by Hans Bethe in the 1930s. In 1932 Mark Oliphant observed the fusion of hydrogen isotopes (light nuclei). (4) As part of the Manhattan Project that created the nuclear bomb (which uses fission not fusion), Hungarian physicist Edward Teller pushed to create the “Super,” a bomb designed to use the force of a fission bomb detonation to ignite a fusion reaction in deuterium and tritium. “Super” seems kind of an understatement, ya think? 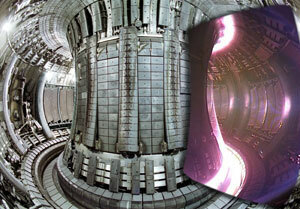 (5) The Joint European Torus (JET) is the largest nuclear fusion reactor ever built. It is located in the UK and experiments first began there in 1983. That’s more than a decade before the Large Hadron Collider was built. Neener neener. (6) A tokamak is “a machine producing a toroidal magnetic field for confining a plasma” and is one of several types of magnetic confinement devices, such as that used for the JET. There must be naughty uber-nerd jokes about “magnetic confinement.” It’s not just my warped mind or anything, right? (9) Inertial electrostatic confinement (IEC) uses an electrostatic field to contain fusion plasma. This type of reactor is cheap to build, costing a few thousand dollars. While popular with hobbyists, the process has yet to produce power. A promising new concept called Periodically Oscillating Plasma Sphere (POPS) has been proposed that would mitigate power loss and might produce cheap fusion power. I’m all of out of naughty plasma containment jokes (but I welcome them in the comments). (10) Bigger is better? Larger than JET, the International Thermonuclear Experimental Reactor (ITER) is a magnetic confinement fusion reactor to be built in France and expected to produce its first plasma operation in 2018. (12) A antimatter-catalyzed fusion reaction could be used to power propulsion. A small amount of anti-protons are fired at a “fusion target” or nuclear fuel. The reaction heats the nuclear fuel enough to cause thermonuclear fusion. Evidently, this method could never produce enough power to be used as alternative energy source here on Earth, but it could theoretically power rockets and ships in space without the need to transport massive amounts of raw fuel. Is that sort of like when I eat chocolate and it catalyzes fat into some kind of thermonuclear fusion evidenced by the number on my bathroom scale? Amazon Listmania for Science Fiction novels dealing with nuclear fusion. Great question, Alice. According to Wikipedia, “[I]ron and nickel nuclei have the largest binding energies per nucleon of all nuclei.” Binding energy is the amount of energy required to keep nuclei together. Jenn– Thanks! I’m particularly proud of the Danger Gal design. Good lord, woman. No wonder you said your head was gonna explode. I couldn’t get past the first two bullets without my brain imploding. Thanks for the information. I will admit I knew very little. Hey, I love your blog design by the way. Yeah, super is an understatement. Why is iron the cut off? This is spooky! Only this morning I was talking to someone about nuclear fusion, which is a subject that comes up in conversation about once a year, if that. If more money and time was put into researching it, it could be a wonderful source of energy supply, and be a replacement for nuclear fission. Lisa, what a great article. Love your blog. I am always looking for new info that I can create Great BS with for my SFR. *G* Danger Gal is cool. You forgot the most rapidly progressing approach to fusion energy… “Fast Ignition” Inertial Confinement Fusion, which will use extremely large lasers to trigger fusion in small pellets of deuterium/tritium fuel (these are two isotopes of hydrogen). US scientists are approaching “proof of principle” in the next 2 years and the international HiPER project is now planning a demonstration reactor to transform the theorem from basic proof itno a technology which will deliver electricity at levels to meet future needs. Try Googling HiPER-Laser… and watch the 14-minute film on their web site. It’s a good movie and you will learn a lot ! Using electrostatic acceleration and confinement, aneutronic nuclear fusion can be more easily achieved, which can be a big step for mankind in producing a really clean energy.